With a peak elevation of 510 ft, the Baldwin Hills are a dramatic natural landmark in the LA basin. They are the highest point along the Newport-Inglewood fault, which created the dome-like shape and steep canyons of the Baldwin Hills. Soils in the Baldwin Hills were mostly formed in place by weathering of sedimentary bedrock and alluvial sediments. 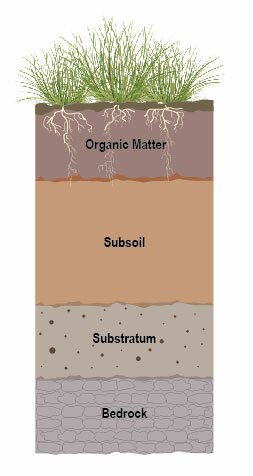 Soils are primarily the Ramona Series, which consist of loam and clay loam. The types of soils in the Baldwin Hills significantly influence the type of native vegetation found in the Baldwin Hills, such as the dominant Coastal Scrub, a shallow rooted plant community that is very drought tolerant, and riparian vegetation where stormwater and irrigation water collects. Generally, the surface organic layer of soil is about 18 inches thick, but soils and topography have been altered by grading to accommodate oil extraction and residential development. The Baldwin Hills have experienced landslides, slope failures, and subsidence, or sinking of the ground, most famously in the 1963 breach of the Baldwin Hills Reservoir, which is now the site of Kenneth Hahn State Park. Subsidence continues today in the oilfield.